This edition of the Tarkasamgraha is- specially prepared with a view to meet the needs of students studying for University examinations. The English Translation of the entire text has been printed just below it for ready reference. In the Notes all points which an ordinary student requires to be explained are explained. The notes are to the point and sufficiently exhaustive. 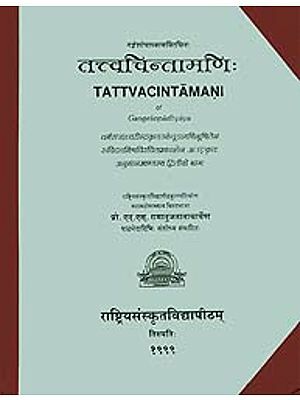 The Introduction deals with questions like the date and life of the author, a general review of the Nyaya and Vaisesika systems, a critical appreciation of the Tarkasamgraha etc. Care is taken not to swell the volume of the book by the addition of irrelevant matter or by the inclusion of unnecessary details which bewilder the student, instead of helping him. We have to offer our grateful thanks to the Managers of the Aryabhusana Press who placed all their available men and type at our disposal and it was this courtesy of theirs that was mainly responsible for the completion of the work of printing this book in time. 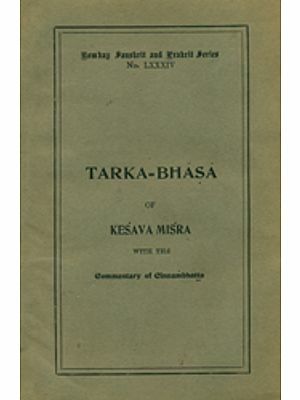 The author of Tarkasamgraha is Annambhatta, (, which name, Mr. Athalye' suggests, is either a contraction of Ananta Bhatta or a Sanskritized form of the Canarese name Anna Bhatta) son of Tirumalacarya. The colophon of the Dipika in one Manuscript reads as follows: Annamlbhatta had for his ancestor one Raghava• who had performed Soma sacrifices. This is the only definite information we get about the author of Tarkasamgraha. Dr. Satischandra Vidyabhusana says 'The prevailing tradition in Southern India is that Annam Bhatt was an Andhra . (Telugu) of North Arcot (Chittur) district, who settled down in Benares at the beginning of the 17th Century A. D.' Accord- ing to another tradition Annambhatta was a Tailanga Brah- mans who after studying Nyaya for twelve years at Kaundinya- pura or Kondu Vidu, became a Professor of Nyaya, and con- tinued to teach Nyayasastra to his pupils till his death. He is said to have visited the shrine of Mallikarjuna at the age of 55, the only occasion when he travelled out of his native place. This account does not seem to be trustworthy as the famous saying clearly suggests that Annambhatta had gone to Benares and studied there. Annam- bhatta had a brother Ramakrsnabhatta who wrote a commen- tary on the siddhanta- Kaumudi. As regards Annarmbhatta's date, we can definitely say that he could not have lived later than 1700 A. D: for one of the manuscripts of the Tarkasamgraha (Weber's Berlin Catalogue, No. 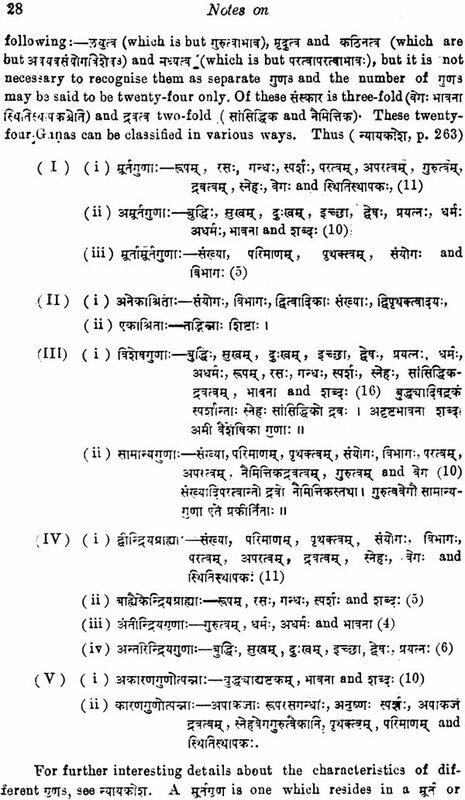 6 ~3) gives 1781 Samvat (1724 A. D.) as the 'date of the writing of the manuscript Annambhatta is also said to have taught to his pupils the works of Gadadhara of Mithila, who lived at the end of the 16th century. The Tar- kasamgrahadipika is also spoken of as Balagadadhari, which shows the great influence of Gadadhara on Annarnbhatta, The first quarter of the 17th century is thus the earliest date before• which Annambhatta could not have lived. In the Dipika (on Section 57) a reference is made to king Tribhuvanatilaka of Kanci. 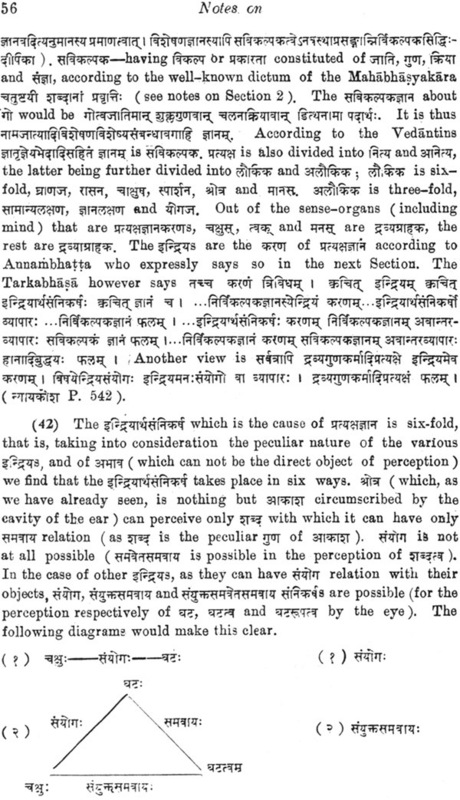 It would be futile' to suggest that Annambhatta is here referring to a contemporary monarch, for first, no such name is to be found in the genealogies of the Kanci kings after the 12th century, as Mr. Athalye remarks, and secondly the passage is- clearly borrowed from the Nyayakandali of Sridhara (about 1000 A. D.). The student of a manual like Tarkasemgraha is certainly not expected to be acquainted with the history of the develop- ment of the Nyaya and Vaisesika systems. But it is worth his while to know the salient features thereof. 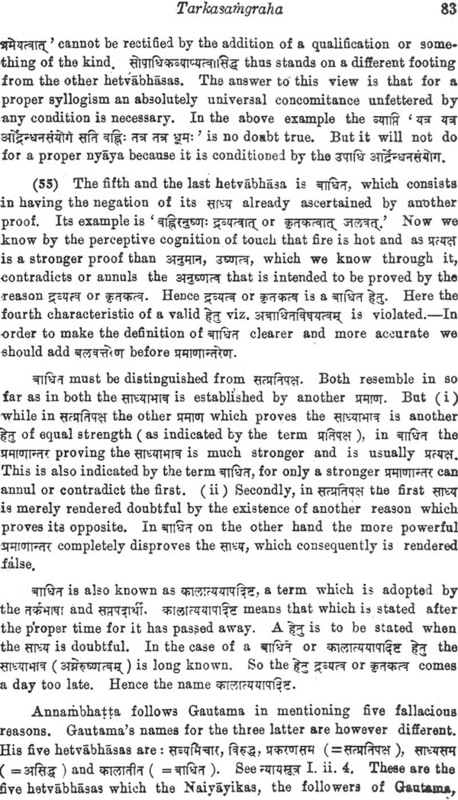 Both these systems originated independently about the beginning of the Christian era, but it was found soon afterwards that their tenets had nothing irreconcilable about them, and long before writers like Sivaditya came on.the field expressly for the purpose of blending the two systems, the Nyaya and the Vaisesika sys- terns had come to be grouped together, like the Samkhya and Yoga systems. 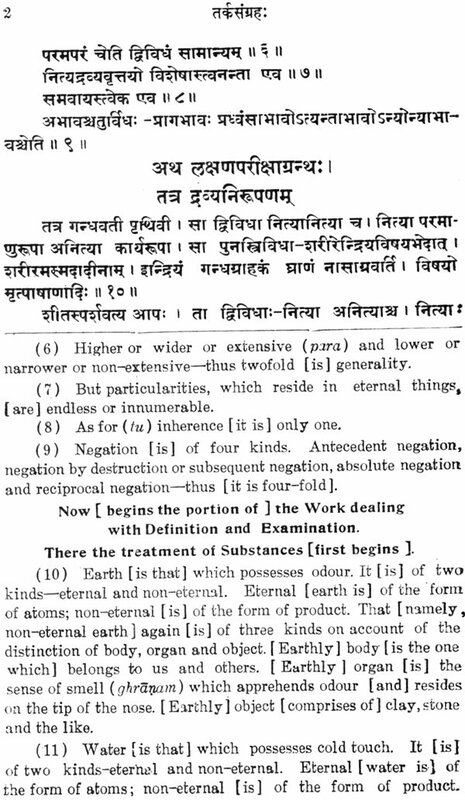 Like all other Darsanas or systems of philosophy, the Nyaya and Vaisesika systems have their own Sutras which must be regarded as the basis of their doctrines. The Vaisesika system is also known as the system of Kanada or Auluka (son of Uluka), Kanada (probably a nick-name due to his having propounded the theory of Kanas or atoms) was the son of Uluka, of Kasyape gotra. He is said to have been so called (Kanada or Kanabhaksa), because he maintained himself on rice-grains fallen in streets like a pigeon. According to another tradition God revealed himself to Kanada who was practising penance, in the form of an owl to expound the six Padarthas, hence the system received the name Aulukyadarsana. Kautilya, does not mention the Vaisesikas by name, but Nagarjuna and Aryadeva (about the 3rd century A. D.) criticise their doctrines. 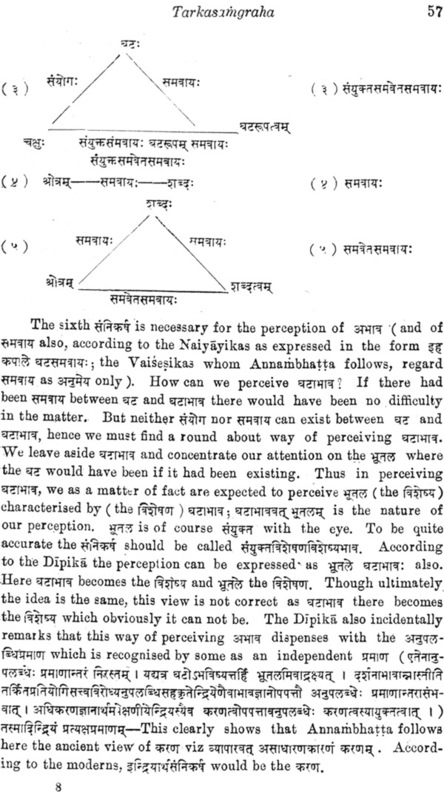 The Vaisesikasutras may therefore be said to have been com- posed about the first or second century A. D. It is possible that these Sutras may have been revised from time to time, before they assumed their present form. 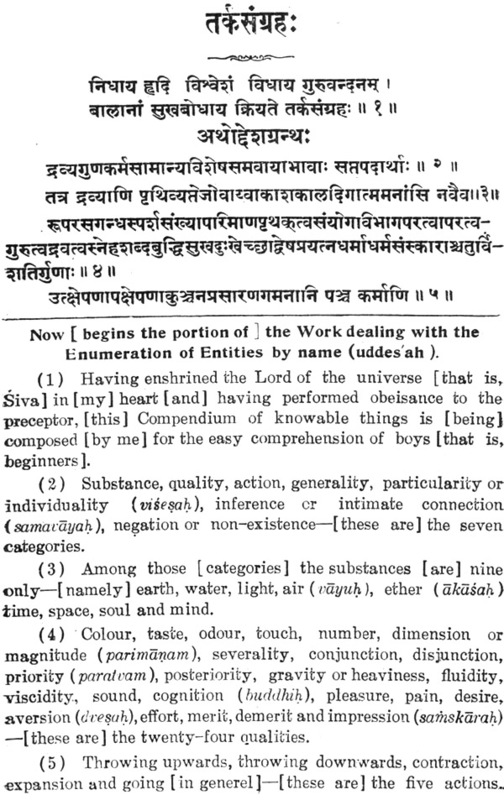 There is no Atomic theory in the Upanisads, though the" word Anu occurs many times. The Bauddhas had something of an Atomic theory and the Vaisesikas may have been indebted to them for that doctrine. There is no direct evidence to show that the Vaisesikas had come under Greek influence in the beginning. As regards the Nyaya system, Gautama is said to be the author of the Nyayasutras. In the Pratirnanataka of Bhasa, the Nyayasastra of Medhatithi is referred to. According to the Mahabharata, Gautama and Medhatithi refer to the same person. Dr. Satischandra Vidvabhusana regards this Medha- tithi Gautama as the founder of Anviksiki, and thus quite a different person from Gautama Aksapada' (hence the name Aksapadadarsana for the Nyaya system), the founder of the Nyaya system. 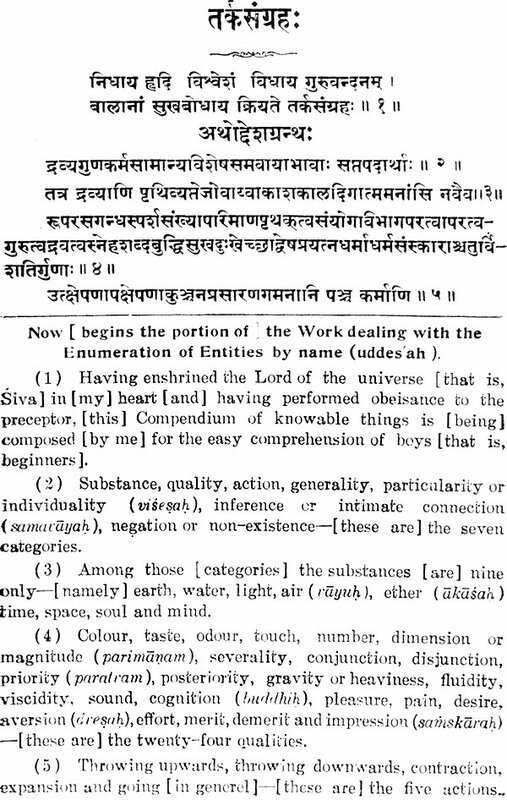 The identification of Gautama Aksspade with the Gautarna of the Gautarna Dharmssutras is without any basis. Vatsyayana wrote his famous commentary on the Nyaya- sutras about the fourth century A. D. It is therefore safe to say that Gautama Aksapada must have lived at least a century or two earlier than Vatsayana. Gautama's date cannot be pushed further back than that.